ACAMS is a prime supplier of ATIS solutions to the world's busiest airports. Last year (2017), an important milestone was met, with over 100 installations world-wide. 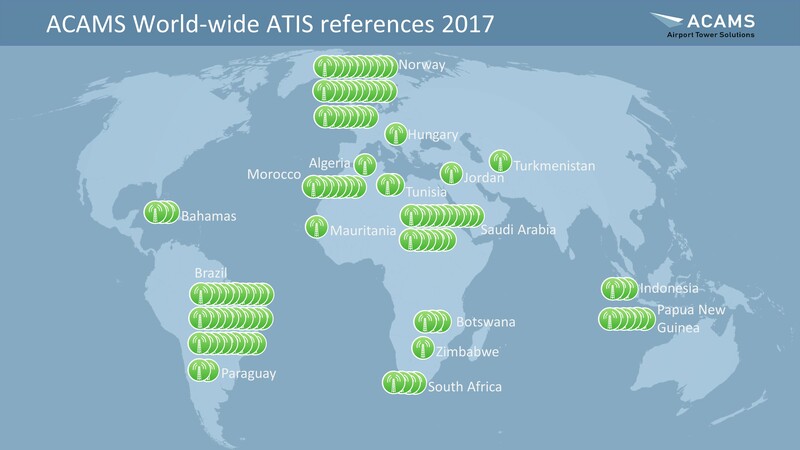 Many of the world's largest international airports, such as Rio de Janeiro, Sao Paulo, Budapest and Bergen rely on ATIS services from ACAMS. ATIS solutions have been provided to these airports since the first ATIS installation was completed in Norway in 2002. Over the years, ATIS solutions have been supplied directly to end users, as sub-supplies to system integrators and in partnership with leading MET suppliers such as Vaisala. Systems have been supplied as stand-alone ATIS solutions, D-ATIS, with VOLMET (D-VOLMET) and as part of ACAMS' integrated tower solutions, I-TWR. The ACAMS ATIS may also be supplied as an integral module of a comprehensive ACAMS integrated tower system. Read more about ACAMS ATIS solutions.